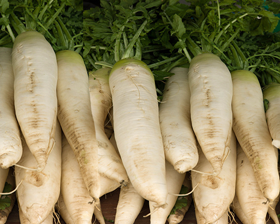 A popular autumn/winter maturing radish producing pure white, crisp fleshed, mild flavoured cone roots. Radish Munich Pub has excellent bolt resistance and winter hardiness. Prefers a well-drained, rich fertile soil. Sow seeds from March to early July. Sow seeds thinly, 1cm deep in drills 30cm apart in soil which has been raked to a fine tilth.